Fitness. Health. Wellness. What’s faith got to do with it? According to The Daniel Plan, living a life of devoted faith has everything to do with health—and it’s difficult to argue against it. 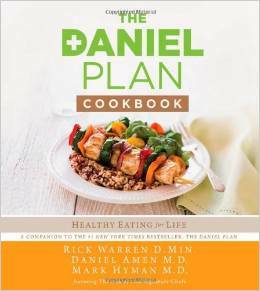 Well-known author and minister Pastor Rick Warren teamed up with two Medical Doctors, Daniel Amen and Mark Hyman, to write The Daniel Plan-40 Days to Healthier Life. The Daniel Plan landed on the NYT Best-Seller List immediately upon being published in December 2013 and is a current Top 500 on Amazon Best Sellers where it also holds a Top 20 ranking in Health, Fitness & Dieting > Nutrition. The Daniel Plan is broken into five key Essentials: Faith, Food, Fitness, Focus and Friends. While these are not unique to wellness and health, you rarely see all five so well packaged together. The Daniel Plan demonstrates the role of each in maintaining health—and more importantly, shows a correlation between them. Written from a distinctively Christian perspective, “Faith” in the The Daniel Plan is not merely holding a sincere religious belief, but a commitment to God through Jesus Christ. The basis of Faith in the The Daniel Plan is much more precise than believing in a higher power; it is rooted in the Christian’s Bible. One of the significant elements found in the book is that relegating Faith to spiritual devotion, segmented from the routine everyday life, is not the message of the authors. Rather, the life of faith intersects with all aspects of life and is revealed in each of the five Essentials for a healthier life. The most common books on health seem to focus on fitness and healthy eating. The Daniel Plan adequately addresses each of these in the Food and Fitness Essentials. However, the The Daniel Plan is much more. The segments on Faith, Focus and Friends are what separates The Daniel Plan from most other health and wellness books. The Daniel Plan moves the conversation from wellness to well-being, and emphasizes how well-being is dependent upon every area of our lives being in order. Warren writes, “It’s hard to be spiritually strong and mentally alert when you are emotionally stressed or physically fatigued. If you are spiritually and emotionally weak or ill, your body cannot perform at it’s peak.” The Daniel Plan is about total health, not simply physical fitness. Warren’s use of Faith goes well beyond embracing a religion. Faith in the context of The Daniel Plan is a .
trust in God to give us the power to change our behavior. Faith will be exhibited by prayer, reading and meditation upon the Bible, understanding the love of God and allowing our minds to be transformed. Elements of a life of faith are woven into each of the following four essentials. Dr. Hyman says, “Food is medicine. Food has the power to heal us.” This section’s purpose is to educate us on how to treat our bodies with respect and kindness. “Real food,” which is defined as anything that is whole, fresh, and unprocessed, “has the power to give you your life back and more fully engage in the purpose for your life.” Like many good books on nutrition, the authors discuss the key topics associated with eating well: carbs, fats, trans fat, calories, fiber, starches, antioxidants, grains, fruits, vegetables, proteins, vitamins, sugar, and artificial sweeteners. Readers learn that in order to stay away from the pharmacy, they would do well to get to know the FARMacy. This segment of the book contains numerous quote-worthy statements on the importance of a healthy diet, (see top quotes at the conclusion of this post.) The real value of this segment may be the simple-to-understand, practical advice on how to change your eating habits, including what to eat, what to avoid and how to plan healthy eating—and on a budget. This section begins with a reference to the motivation to honor God with our bodies, (I. Corinthians 6:19- 20). From this point, fitness moves to getting our body in action. Instead of dwelling on the typical expressions of exercise and working-out, there is an emphasis on play and joy. The dangers of sitting and inactivity are exposed and simple, everyday movement, stretches and activity are encouraged. Monitoring and keeping track of exercise is highly recommended, citing research that confirms it increases the likelihood of accomplishing fitness goals. While this section provides valuable encouragement and practical first-steps to move from the couch to activity, there is also beneficial insight for those of us who are already committed to exercise. The first time I read The Daniel Plan, the Focus Essential did not resonate; it seemed out-of-place. Yet, in re-reading it I came to see it as a valuable component of well-being. Here, the attention is given to the mind and to the health of the brain. The authors begin by sharing “when the brain in not healthy, people are sadder, sicker, poorer and less successful.” From there the reader finds ample practical advice on how to boost brain health, particularly through brain envy, avoiding anything that hurts it, and engaging in healthy habits that boost brain health. True to the nature of the book, this section on Focus is filled with spiritual application as the benefits of biblical meditation, prayer and rightful thinking are extolled. It’s the latter focus on rightful thinking, or the renewing of the mind, that is well articulated. “Being overweight or unhappy is as much a ‘thinking disorder’ as it is an eating or mood disorder.” Particular emphasis is given to dropping the lies we tell ourselves, fostering gratefulness and living lives with a sustained focus on purpose. “When you have friends to go with you on the journey toward better health, you are more likely to succeed.” Continuing, the authors share how being engaged in community will improve your health. However, they caution, “The opposite is also true: Isolation injures us.” Not just a few us are forced to consider our circle of friends, and more particularly the effect they may be having on our health, as a result of reading the mounting evidence The Daniel Plan provides for the following statement: “Our social circles influence our health even more than our DNA.” Continuing with this thought, the authors write, “We are more likely to exercise and eat healthy food, to not smoke or overeat, if our friends also practice healthy habits.” The Friends Essential is full of admonition to engage in healthy interaction with family, church groups and our circle of friends. And love is the foundational key to healthy community. I agree! I believe this book is well balanced for all individuals. Loved it!